Ever feel like you’re talking to no one? No, I don’t mean like when you open your mouth and no one’s around. I’m talking about your email list. You can open it right now and see that you have a large audience, waiting to hear what you have to say. How is it possible to have an email list—a list of people who have demonstrated an interest in your insurance or mortgage services—and have them give you absolutely no response to your emails? It may not just be any one thing. In fact, it may be an entire host of things. But the simple truth is this: your email blasts aren’t optimized to generate an effective response. That’s okay. In this article, we’re going to tackle five specific steps to optimizing email blasts so you never have to feel like you’re sending emails to no one again. …but it’s also kind of like the entrée. Not only is a clever, engaging subject line important, but it may be the single most important element in any email blast you ever send out. It’s that subject line that’s going to entice people to read further. It’s that subject line that’s going to introduce some tension that the reader needs to feel is resolved. It’s that subject line that’s going to determine the success of your entire email blast. So it’s worth getting it right. The element of surprise. Think about things that are funny because they’re surprising. Or shocking because they’re surprising. Or urgent because they’re surprising. All of these essential elements of a quality subject line depend upon that element of surprise. Don’t be afraid to sit down and brainstorm the most surprising claim you can make in a subject line—so long as the content of the email backs up any claims you make. Make an implicit promise of interesting content. Think “show,” not “tell.” Using a single word is a nice way to catch someone by surprise while also hinting at the content that lay within an email blast. “Five ways to…[fill in the blank]” can also be a tremendous way of inspiring someone to click on your email. Bottom line? If you want a response from your email blasts, you first need to get people to open them. That’s great and all. But what if a restaurant had fine table settings…and absolutely horrible steak? It wouldn’t be much of a restaurant at all. It works the same way with your emails. A lot of sizzle and pizzazz might be nice to look at, but it doesn’t really work to generate the kind of response you’re after. You’ll have to think about the engaging things the text can say. Think about it: what is your audience concerned with? What’s troubling them? What answers are they looking for? Create emails that help supply answers for these needs and you’ll do far more to reach out to them than any email template ever could do. Stick to plain text. People care about emails because of what they say, not how they look when they say it. If you can focus on the content, then you’ll be that restaurant with plain place-settings—but steak that keeps the customers coming back. No one wants to sit down at their inbox over their lunch break and read a novel. As it turns out, brevity is also the soul of an effective email blast. You want to be helpful, sure, but you don’t want to get carried away. The goal, remember, is to get responses from these email blasts. That means generating content that gives them a taste of what you can offer—but not necessarily the whole thing. If you were selling a novel, you might include the first three paragraphs. Just a tease of the enjoyment that’s to come. Make it the same way for your email blasts. Create a tease of what you can help do for them. For instance, if you’re promoting a mortgage calculator, talk about how simple it might be to save tens of thousands of dollars with just a little bit of math. You don’t have to give everything away—just enough to entice their interest. Create a link in the email that essentially says, if you want to keep enjoying this kind of content, you’ll have to click here to do it. Once you have the idea behind a basic email blast set and ready to go, you have to think about the next step. After all, you aren’t sending out emails for your health, here. You’re sending out emails to get a specific response. And if you play your cards right, that response can be increased traffic to a landing page of your choice. This isn’t to say that a call to action will automatically fix everything that’s wrong with your emails. You still have to use the content of the email to create an urgent and compelling reason to visit the link you provide. You should also focus on creating a landing page that answers the urgency created in the email. Remember: you’re dealing with real people here. People with real problems who are looking for solutions. Structure your email to introduce the problem and let the call to action be the solution. You’ll be amazed at how this basic structure can be repeated time and time again to ensure a healthy response to your email blasts. If you lead someone to a landing page with a form on it, will you follow up? Remember: just because someone clicks on your website doesn’t mean they’re always going to seek business from you. You have to realize that insurance and mortgage questions can require a lot of trust on their part. It may take them several visits to be willing to give out their information. You can facilitate the formation of such a relationship by using autoresponders. 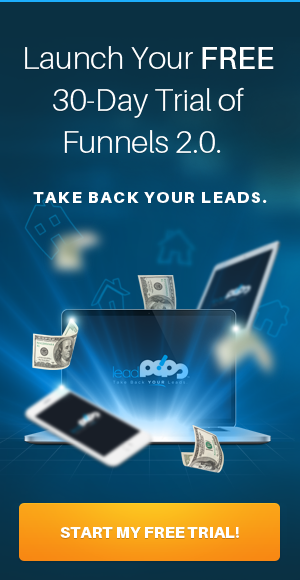 Combined with your landing pages, this system will make it feel like they’re already working with your business to some degree. That, in turn, creates a sense of trust. There’s already something there. But this doesn’t happen automatically—even with autoresponders. You need the infrastructure in place to make it all happen. That’s where leadPops comes in. 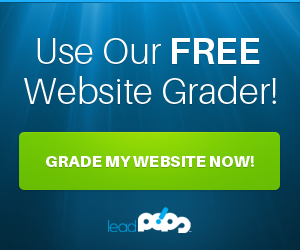 Use a free trial of leadPops to completely overhaul the way you look at email blasts and their relationship with your potential leads. Eventually, you’ll stop feeling like you’re talking to no one as the responses roll in.